AP Gnanadhara Remedial teaching programme in summer 2018 - Conduct of a one day Teleconference on 20.04.18 to the Teachers engaged in Gnanadhaara Participation of teachers the Teleconference in MRC/ Complex High Schools Deputation of State Resource Persons to SCERT for 2 days from 19.04.18 to 20.04.18 Orders issued as per R.C.No.21/ B/SCERT/2018 Dated: 17.04.2018/AP Gnanadhara Remedial teaching programme Conduct of a one day Teleconference on 20.04.18 as per R.C.No.21/AP Gnanadhara Remedial teaching programme one day Teleconference Deputation of State Resource Persons list as per R.C.No.21/ B/SCERT/2018 Dated: 17.04.2018. 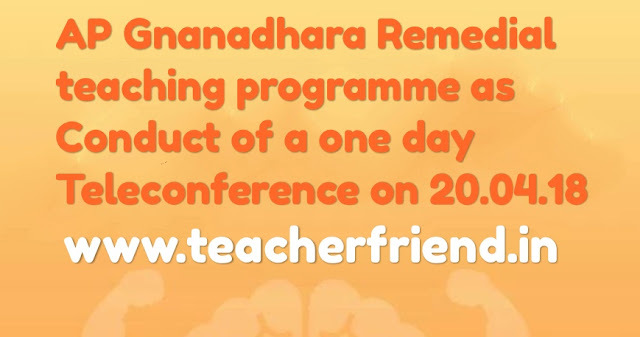 AP SCERT Amaravati Gnanadhara Remedial teaching programme in summer 2018 - Conduct of a one day Teleconference on 20.04.18 to the Teachers engaged in Gnanadhaara Participation of teachers the Teleconference in MRC/ Complex High Schools Deputation of State Resource Persons to SCERT for 2 days from 19.04.18 to 20.04.18 Orders issued as per R.C.No.21/ B/SCERT/2018 Dated: 17.04.2018. AP Gnanadhara Remedial teaching programme Conduct of a one day Teleconference on 20.04.18 as per R.C.No.21. All the District Educational Officers in the state are aware that the Gnanadhaara programme is about to start on 01.05.18 in residential mode at the identified venues. Connected to this, it is planned to conduct a one day orientation programme to all the teachers who are engaged from different managements to Gnanadhaara Programme. Hence all the District Educational Officers are requested to instruct Head Masters/ Principals of welfare schools/APMS/S.Os of KGBV and Mandel Educational Officers concerned, to depute the above said teachers to attend one day teleconference on Mana T.V in their respective centres on 20.04.18 from 10.00 am to 4.30 pm. AP Gnanadhara Remedial teaching programme one day Teleconference Deputation of State Resource Persons list. The hourly schedule is annexed to these proceedings. You are further informed to ensure the attendance of MEOs, SSA Sectorial Officers, 2 DIET lecturers, CRPs, Complex Head Masters to this tele conference. Further, the District Educational Officers of Kadapa, Anantapuram, Nellore, Krishna, Guntur and Prakasam are requested to depute the following teachers to participate in the teleconference as Resource Persons. Telugu - Mr J Lakshmikanth - ZPHS Gannavaram, Mustabad, Krishna Dist. Maths - Mr Mohan Krishna - District Assessment Cell, Prakasam Dist. P.ET - C H V Nagaraju - P.ET, ZPHS Piduguralla, Guntur Dist. The resource persons are instructed to come with a PPT to present during their subject.